just as it will treat them both differently from their Black cousins. another fantasy fan, Derek, who is a Deaf, Black ASL user. She goes to Derek for help with Emma but doesn't always know the best way or time to ask for it. As she and Derek meet in person, have some really fun conversations, and become friends, Jilly makes some mistakes . . . but comes to understand that it's up to her, not Derek to figure out how to do better next time--especially when she wants to be there for Derek the most. 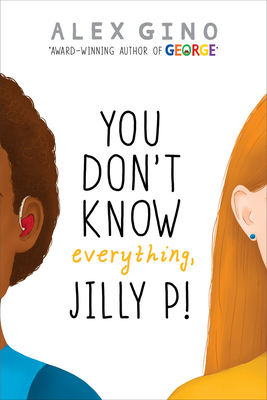 Within a world where kids like Derek and Emma aren't assured the same freedom or safety as kids like Jilly, Jilly is starting to learn all the things she doesn't know--and by doing that, she's also working to discover how to support her family and her friends. difference can make you a better person, and how being open to change can make you change in the best possible ways. Alex Gino loves glitter, ice cream, gardening, awe-ful puns, and stories that reflect the diversity and complexity of being alive. George was their first novel. George was a winner of the Children's Stonewall Award, the Lambda Literary Award, and the Children's Choice Book Awards, among a host of others. George was also featured on several Best of the Year lists. For more about Alex, please visit alexgino.com.